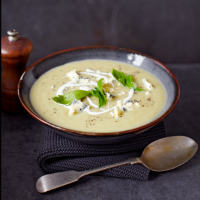 A simple cream soup for a chilly day. If you want to gild the lily, a few tiny croutons will add some crunch. 1. Melt the butter in a large saucepan and add the celery, leek, onion, garlic and salt. Sweat gently over a low heat for about 20 minutes, stirring often, until soft but not browned. Add the potato and stir together for a couple of minutes, then pour in the stock, plus 500ml water. Bring to a boil, then reduce the heat and simmer for 15-18 minutes, until the vegetables are soft. 2. Whizz in a blender until totally smooth, then add the cream and blend again; thin with a splash of water or milk, if needed. Season with pepper, and more salt if you think it’s needed. Ladle into bowls and add a swirl of cream. Scatter with the crumbled stilton and reserved celery leaves before serving.